74,1 x 60,3 cm - 29 3/16 x 23 3/4 in. Acheté directement à l’artiste par la galerie Charles W. Deschamps, Londres, mai 1876 - James Staats Forbes, Londres - Goupil & Cie, Paris, juillet 1891 - Potter Palmer, Chicago, septembre 1891 - Famille Palmer - The Art Institute of Chicago, 1963 (Don M. et Mme Gordon Palmer, M. et Mme Arthur Wood, Bertha Thorne). Paris, 11 rue Le Peletier, 1876, n° 47 - The Art Institute of Chicago, 1933, n° 283 - Northampton, Smith College Art Museum, 1933, n° 2 - Springfield, Museum of Fine Arts, 1935, cat. 12 - New York, Metropolitan Museum, 1941, n° 40 (repr.) - Cleveland, Museum of Art, 1947, n° 33 - Albi, musée Toulouse-Lautrec, 1980, n° 7 - The Art Institute of Chicago, 1984, n° 22, repr. p. 55 - Tokyo, Kyoto, Fukuoka, 1985-1986, n° 30 - Léningrad, Moscou, 1988, n° 6 - Detroit, Philadelphie, 2002-2003, fig. 76, repr. p. 72 - Londres, Washington, 2005-2006, n° 26, repr. p. 70 (Londres seulement) - Sao Paulo, Museu de Arte, 2006, p. 218, repr. p. 220 - Fort Worth, Kimbell Museum of Art, 2008, n° 39 (repr.) 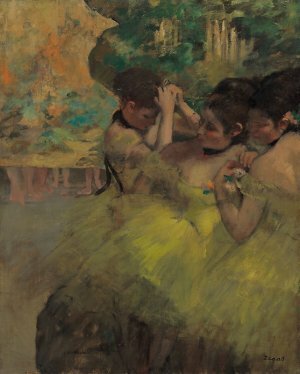 - The Art Institute of Chicago, 2015-2016, Degas: At the Track. On the Stage (Sans catalogue). Porcheron, Le Soleil, 2 avril 1876, p. 2-3 - Silvestre, L'Opinion nationale, 2 avril 1876, p. 3 - Huymans, L'Art moderne, 1883, p. 127 - Manson, 1927, p. 47 - Northampton, Bulletin of the Smith College Museum of Art, juin 1934, repr.p. 17 - Slocombe, Coronet, avril 1938, p. 20 (repr.) - Lemoisne, 1946-1949, II, n° 512, repr. p. 285 - Reff, Art Bulletin 50, 1er mars 1968, p. 90 - Gaunt, 1970, p. 224 - Maxon, 1970, p. 88-89 (repr.) - Rewald, GBA, 1973, p. 88, fig. 35 - Lassaigne, Minervino, 1974, n° 726, repr. 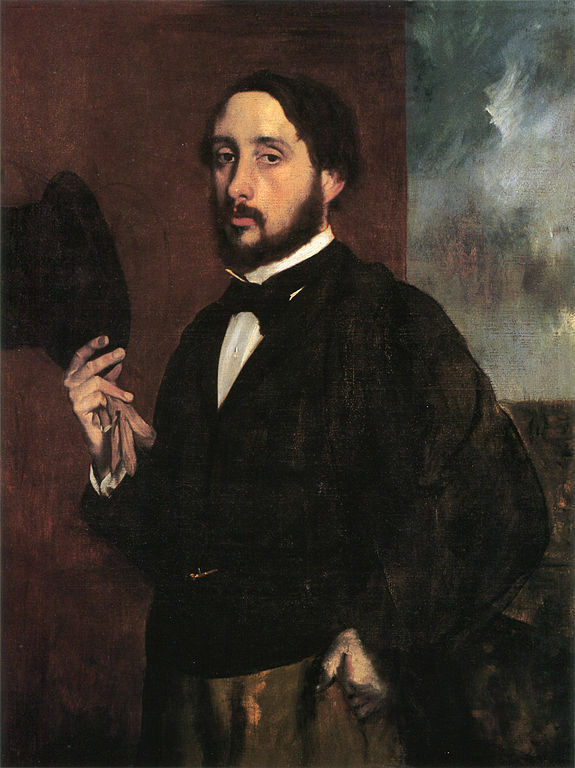 p. 120 - Degas in the Art Institute of Chicago, 1984, n° 22, repr. p. 55 - Shackelford, cat. exp. National Gallery, Washington, 1984, p. 111-112, fig. 5.1 - Guillaud, 1984, p. 172, fig. 148 - Paris, Centre culturel du Marais, 1984-1985, fig. 148, repr. p. 172 - Moffett, cat. exp. Washington, San Francisco, 1986, fig. 3, p. 146, repr. p. 149 - Boggs, cat. exp. Paris, Ottawa, New York, 1988-1989, fig. 109, repr. p. 215 - Berson, 1996, I, p. 48, 86, 103, 109, 290; II, p. 35, 149 (repr.) - Boggs, cat. exp. The Art Institute of Chicago, 1996, n° 10, p. 28-30 (repr.) - Kendall, cat. exp. Londres, Chicago, 1996-1997, fig. 138, repr. p. 127 - Impressionism and Post-Impressionism in the Art Institute of Chicago, 2000, p. 48 (repr.) - Detroit, Philadelphie, 2002-2003, fig. 76, repr. p. 72 - The Age of Impressionism at the Art Institute of Chicago, 2008, n° 3, p. 90.